Sometimes email is the forgotten marketing channel. It’s not as new or topical as social or mobile, but it’s as reliable and profitable as ever. A study from the Direct Marketing Association says that email provides a $39.40 return on every dollar invested into it. 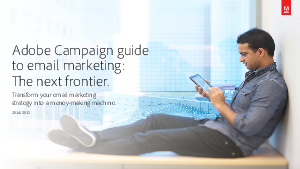 We’ve produced a marketer’s guide that discusses the next frontier of email marketing. Learn the advantages of triggered and retargeted emails, and get real-world insights into smart email marketing from C Spire Wireless and others.